Today's election 2016 news focuses on both front-runners from the Republican and Democratic parties. Election 2016 News: Trump Stands by Claims – Republican presidential front-runner Donald Trump met with a group of 100 African-American pastors on Monday. Trump's campaign was criticized for saying that the pastors were initially endorsing the Republican candidate. On the day before the meeting, Trump's campaign canceled the news conference and said Trump would be holding a private meeting with the pastors instead. Many of the pastors at the meeting expressed an affinity for Trump, but there were no formal endorsements. One pastor was quoted saying "everybody in the room likes Donald Trump," The Hill reported. Trump continues to see massive numbers at his campaign rallies. A rally in Sarasota, Fla., last week boasted 12,000 attendees. A Monday rally in Macon, Ga., had several thousand people. Trump was criticized by the media last week for his supporters allegedly attacking a Black Lives Matter protestor during the Sarasota rally, despite Trump repeatedly telling the crowd to "be nice." 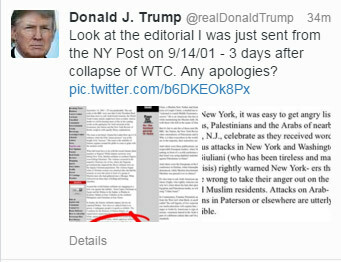 Trump is also sticking behind his claims that thousands of Muslims in New Jersey celebrated the collapse of the World Trade Center. He continues to post supposed evidence to his Twitter account backing up his claims. Election 2016 News: Clinton Announces Infrastructure Plan – Democratic presidential front-runner Hillary Clinton announced a $275 billion infrastructure spending plan on Monday, and she plans to focus on jobs and the economy through December, Politico reported. According to The Wall Street Journal, Clinton's 7,800 pages of emails released by the U.S. State Department show she kept a close watch on domestic politics, even as she traveled the globe and managed crises in her role as secretary of state. The emails detail Clinton's aides informing her about her public image and any competition she would have for election 2016. Many liberal Democrats are afraid that a U.S. Federal Reserve rate hike in December could hurt the Democratic presidential nominee's chance of winning the 2016 election, Politico reported. A higher interest rate could strengthen the U.S. dollar, which hurts U.S. exporters, and could create widespread corporate defaults abroad for companies who have debt in dollars. There's also a chance that investors could react negatively to a rate hike, making the economy seem unfavorable before President Obama's departure from the Oval Office. 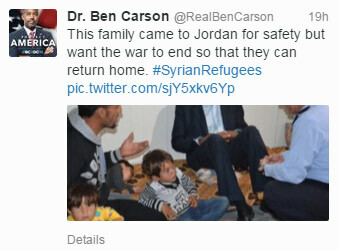 On Saturday, Republican presidential candidate Ben Carson traveled to Syrian refugee camps in Jordan. Carson said that nations should do more to help Jordan deal with the refugees. He said in the coming days he will offer what he believes are "real solutions to the problems created in part by the Obama-Clinton administration's failed policies," the WSJ reported. Republican Senators and presidential candidates Ted Cruz and Marco Rubio are climbing in the polls. Election 2016 polls pin Texas Sen. Ted Cruz at 12%, trailing Florida Sen. Marco Rubio, who is at 12.7%, according to Real Clear Politics' poll average. The polling number suggests there is rising support for candidates who might seem more electable to some voters than Trump. Cruz has largely kept in the shadow of Trump (they agree on many of the same policies), but now two Iowa polls show him in second place, the WSJ reported. Cruz said his strategy is to capture the nation's evangelical vote, which he said is 90 million strong. Fifty-four million of these 90 million Christians stayed home during the 2012 presidential election. Cruz said he believes he can draw them out to vote Republican in 2016, according to the WSJ.